If you’re looking for a place to get a complete family-friendly Halloween experience, look no further than the Disney theme parks! This time of year the parks are jam packed with tasty themed treats, colorful characters, and Halloween experiences that will bring a smile to the faces of the young and the young-at-heart. Keep reading to find out all about how to celebrate Halloween at Disney resorts. Both the Walt Disney World Resort in Florida and the Disneyland Resort in California will boast colorful Halloween decorations, yummy holiday treats (my favorite is the pumpkin fudge), and special Halloween themed merchandise such as Mickey ears and popcorn buckets. The movie The Nightmare Before Christmas and the Haunted Mansion attraction are both popular this time of year, so expect to see extra merchandise throughout the parks themed for these fan favorites. Also be sure to keep an eye out for special Halloween themed decorations and beautiful flowers in fall colors in the Hub areas of both Disneyland and Magic Kingdom. If you didn’t know, the Hub is the area where Main Street USA meets the castle. It’s referred to as The Hub because from that central area, the parks branch out into all the different lands, similar to spokes on a wheel. Every year, the Magic Kingdom at Walt Disney World offers a separate ticketed event, Mickey’s Not So Scary Halloween Party. 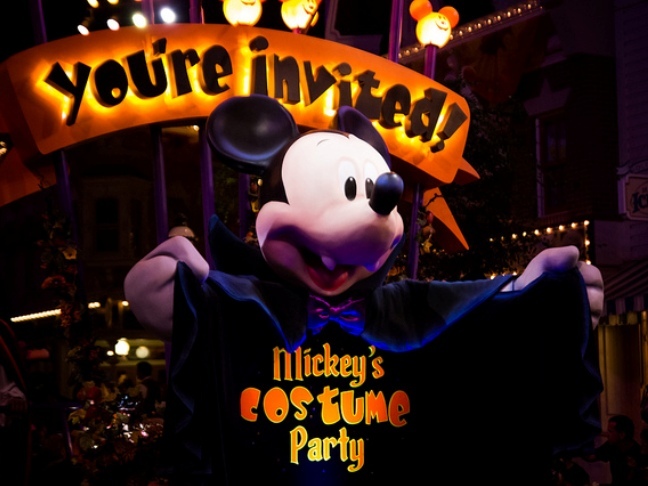 The event, taking place on select nights in September and October, features the Mickey’s Boo-To-You Halloween Parade, a fireworks show, special villains character meet & greets, Club Villain dance party, and trick-or-treating trails with tons of candy, so come prepared with an extra large pillowcase! Tickets are $68.00 for adults and $63.00 for children. Disneyland Park in California is offering two special attraction overlays for enhanced spook-tacular fun. Every year for Halloween and Christmas, the Haunted Mansion is transformed into Haunted Mansion Holiday, with a The Nightmare Before Christmas theme. And just for Halloweentime, Space Mountain turns into Ghost Galaxy, with creepy music and ghastly images projected all around you. This one might be a little too scary for younger children, but the teens will love it! In addition to these enhanced attractions, families can also visit the Halloween Carnival at Big Thunder Ranch in Frontierland, where they can visit with Disney characters in Halloween costumes and rare Disney villains, as well as watch pumpkin carvers and magic shows. This is a laid-back area with fun for children and adults of all ages. It’s one of my favorite places to sit down with a bite to eat and relax. Disneyland also will be offering a separate ticketed event similar to the one at Walt Disney World. Mickey’s Halloween Party will feature trick-or-treating, a special fireworks show, and a dance party with the furry friends of Monsters U, to name just a few features. One of the best parts about the Halloween parties at the Disney parks is adults can come dressed in costume! On a regular day, adults are not allowed to wear costumes into the parks because it can cause confusion for small children. 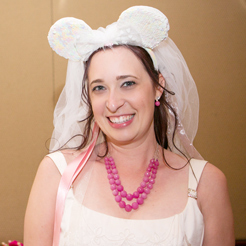 The Halloween parties give us adults a chance to dress up as our favorite Disney hero or villain or princess, and party the night away at Disney! I love when I see families all dressed up together with a theme (for example, as the family from The Incredibles, or everyone as a different Winnie the Pooh character). If your family were to visit for one of the Halloween parties, who or what would you dress up as?